Colors are everywhere: some vibrant, some pastel. Things would be dreary if we suddenly removed color from our lives. Some might even go the extra step to ensure that their surroundings are always colorful and lively by painting the walls in their home or dressing in only the hottest pinks or brightest yellows. 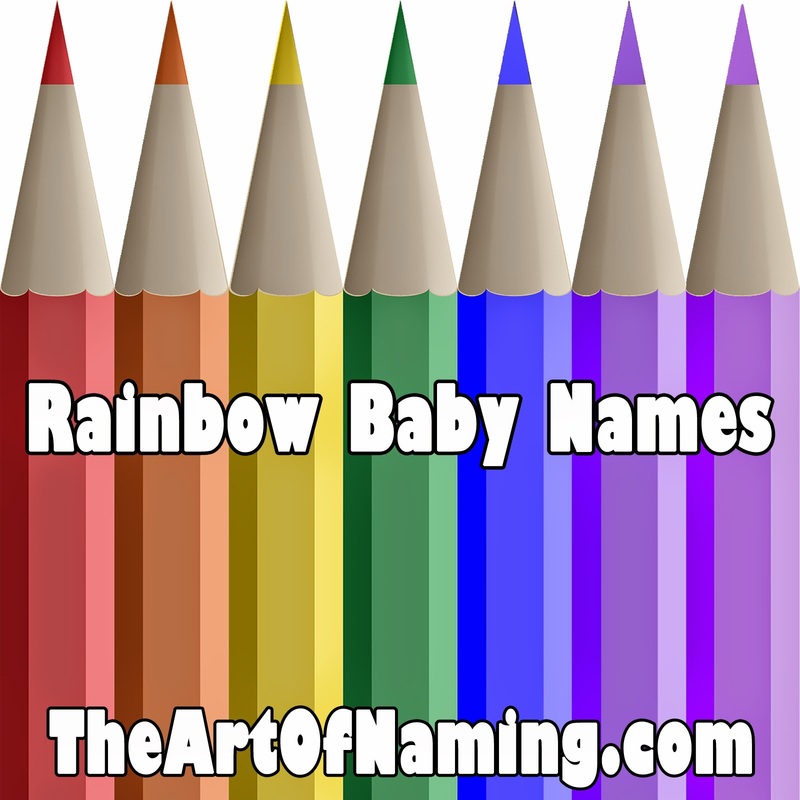 Plenty of parents already opt for nature names so why not extend your love for colors to baby naming, too? The last three on the red list are probably the most popular with Rose leading the pack, however Scarlett is more popular than Scarlet. Would you use one of the more unusual reds like Amaranth or Carmine? While Rusty and Tawny are rarely used, Amber was huge in the '80s and Sienna peaked in 2007. Peach doesn't have any recorded usage. Many of these are rather unusual. The most popular by far is Jasmine which ranks at #100 in 2014! Green names are fun, especially the more playful ones like Kelly which only came about because of the Irish surname's association with Ireland and the color green. And then there's Hunter green which was the color of choice for hunters back in the 19th century. The others are very nature related. Most of these blues are pretty obscure as names. Sky (g) is most popular at #740 in 2014. If you’re looking for something related to a shade of blue that is a little more “namey” and a little less unusual, try Alice, Carolina, Celeste, Maya and Tiffany. Violet is a true vintage name and has come back in style after being popular in 1920. (Check out the 100 year rule!) Iris is also ranking well these days! The others would make beautiful and quirky middle names! Today's featured name comes from the list of The Very Best K Names for Boys and Girls. This one actually happens to be unisex these days but it will be mainly presented for males in this article, (hence the blue below). 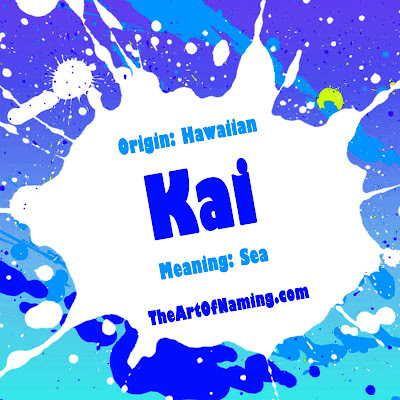 The Kai that I'm most familiar with is the Hawaiian name that means "sea". This is the one being featured here. Other possible meanings for this name include "forgiveness" in Japanese, "food" in Maori and "willow tree" in Navajo. Kai is also considered a diminutive for names like Gerhard, Nicolaas, Cornelis and Gaius/Caius. It is also a feminine variant of Kaja which comes from Katarina. Internationally, Kai ranks well! It is actually doing better in other countries for boys than it is in the US. However, we're the only country that has a ranking for this name as a feminine one. 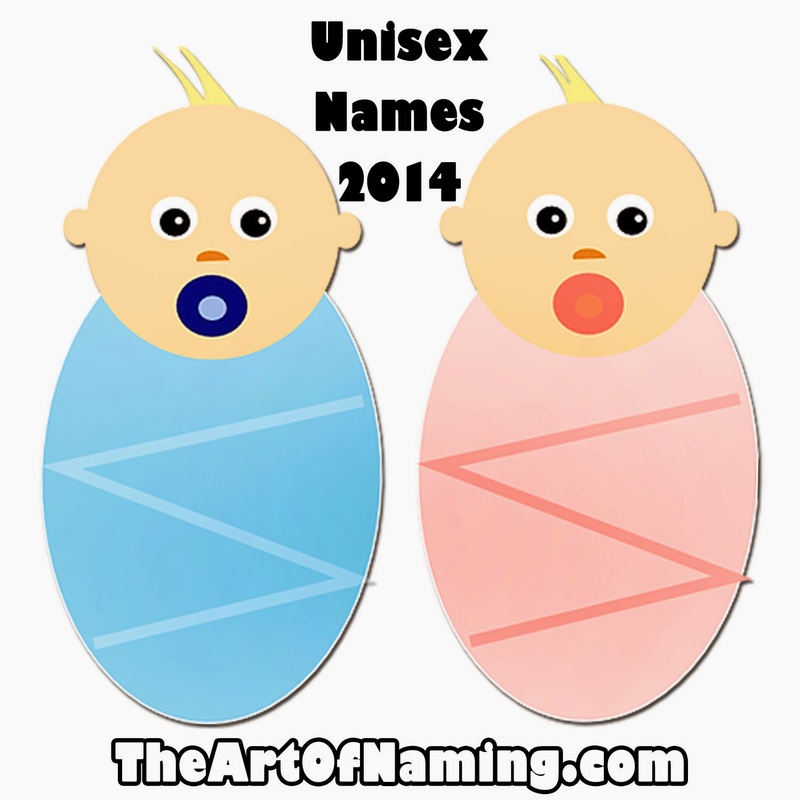 This means the name's unisex ratio is 90% boy / 10% girl based on the births for 2014. In England/Wales, Kai recently ranked at #64 for boys. Canada (BC) ranked it at #36; it was #69 in Australia, #85 in Ireland, #65 in Northern Ireland, #55 in Scotland, and #121 in the Netherlands. These are the most recent rankings I found so they may vary a bit today. The name Kaia is a feminine form of Kai that's also ranking well at #551 in the US. Unless you're Hawaiian, it is probably going to be difficult to find a middle name that will share Kai's origin. I wouldn't worry about that. The above names simply sound nice and flow well with Kai. What would you pair with Kai? If you weren't a fan of the very best C names for boys and girls, perhaps you'll prefer the very best K names! 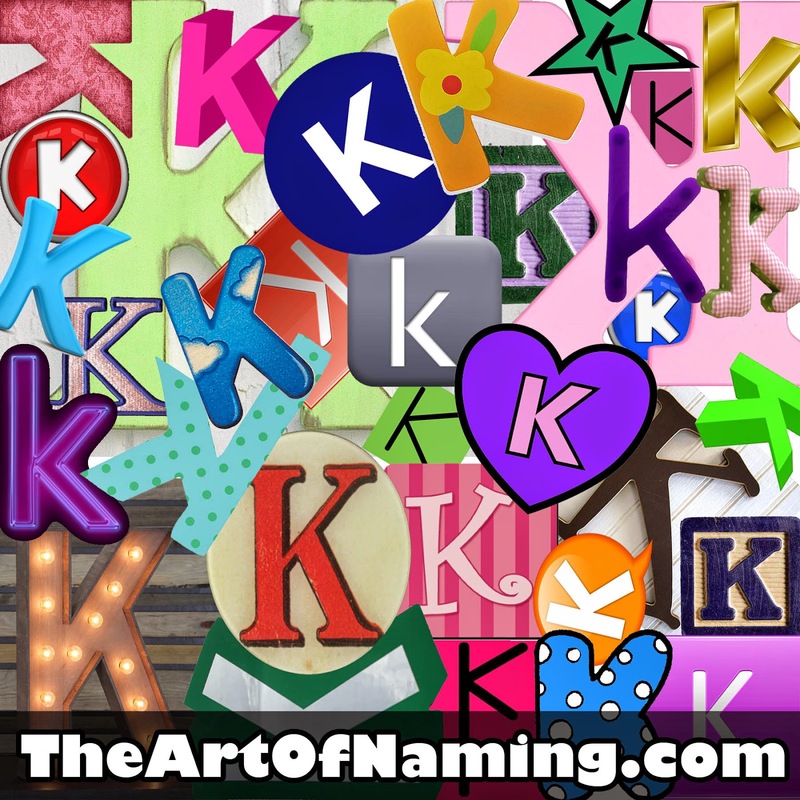 While similar, the letter K gives a whole different vibe to names than the letter C.
K names are sometimes thought of as trendy alternate spellings of traditional C names. However, many Greek names, for example, were spelled with a K originally. So when it comes to spelling a name with a C or a K, it's all a matter of taste and opinion. If you happen to enjoy the letter K, this is your list! Below are 25 of the very best names for girls that start with the letter K, and 25 for boys too! 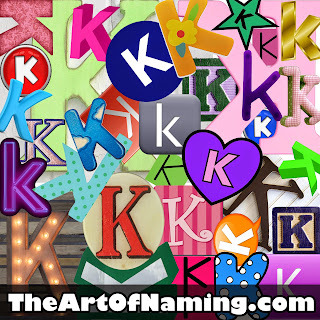 Be sure to share your favorite K names in the comments whether they're listed below or not! Did I miss any of your favorites? Or perhaps K isn't your letter after all. If not, don't worry, there are 25 more letters to explore and we've already covered quite a few! Use the links below to browse the other letters! Last month we discovered which names were most favored by America in 2014. As you know, Emma and Noah were ranked at #1. Have you ever wondered which unisex names are the most popular? The SSA doesn't make a separate list for unisex names. It's up to us to determine which names are used for both boys and girls. If you saw my previous article regarding the boy-to-girl ratios of every unisex name within the Top 1000, you'll see that some names are used more often for one gender than the other, yet some names are very evenly used. So how can we determine which unisex names are the most popular based on this information? Since there are two genders, it's a bit complicated to determine the exact popularity, especially since I was taking into account the boy-to-girl ratios of the names, the number of births for each gender, and the rank assigned to the names by the Social Security Administration.. While determining which unisex names are the most popular across the genders, my dilemma was whether or not to include the barely-unisex names like Logan (94% male) or Harper (97% female). In the end, I did include those. 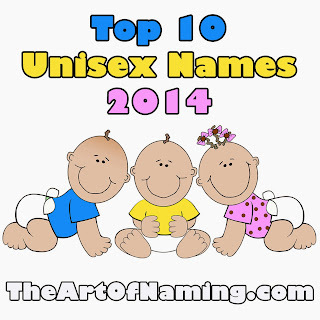 I ranked the Top 10 Unisex Names of 2014 based on the list of names and their data from my previous article. All data ultimately came straight from the SSA's list. In every data crunching method that I toyed with, Avery was without a doubt the most-used unisex name by both genders. At #13 for girls and #186 for boys, Avery is definitely popular. It comes from a surname that may have been derived from either Alberich or Alfred, both names having a meaning related to elves. Because of that, Avery is generally said to mean "Elf Ruler". Our second most popular unisex name is Riley which also comes from a surname. It actually has two origins. As an Irish surname, it's a variant of Reilly whose meaning is unknown; and as an English surname, it comes from a place name that refers to a "rye clearing". In 2014, Riley ranked at #47 for girls and #173 for boys. Between Peyton and Payton, this name is getting a lot of usage for girls. However, the boys still like it too. Peyton in particular is 71% girl but when you average both ranks, it becomes our #3 unisex name. It came in at #56 for girls and #210 for boys which are respectable ranks! Peyton comes from an English surname which came from a place name meaning "Paega's town". Both Jordan and Jordyn have usage as unisex names within the Top 1000. While Jordyn is 91% girl, Jordan is 84% boy. Since we are only considering Jordan here as our #4 unisex name, it's interesting to note that it ranked at #55 for boys and #247 for girls. This name is generally based on the Jordan River near Israel. This one surprised me a bit. It feels very masculine but it is being given to girls with increased frequency now. 20% of all Parkers born in 2014 were female, which is up from 17% in 2013. It ranked at #73 for boys and #235 for girls last year! Parker is an English occupational surname that refers to a "keeper of the park". From an English surname, Hayden is derived from place names meaning "hay valley" or "hay hill". This name has a decent split of 63% boy and 37% girl. It ranks at #142 for boys and #199 for girls which makes them both reasonably popular. That's why this name is our #6 unisex name for 2014! Following closely behind Hayden in terms of the rank averages, Angel is well used for both genders primarily in the Hispanic community. It's more popular for a boy with 84% of all Angels being male. It ranks at #67 for boys and #275 for girls in 2014. The name is based on the heavenly creatures and means "messenger" in Greek. 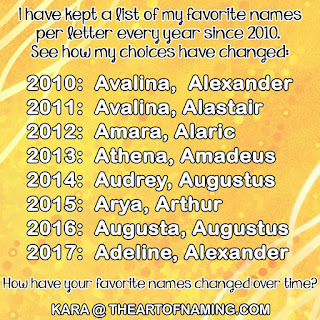 From a Greek name meaning "defender", Alexis is our 8th most popular unisex name in 2014. It ranks higher for girls at #64 but the boys hold their own at #302. The boys actually gained 2% from 2013 in the boy-to-girl ratio of usage. This name is predominantly used by boys and ranked at #13 in 2014 with over 13 thousand births. However, it also ranked at #391 for girls which is actually quite high despite there being only 828 female births. Logan is unisex even though it has a 94/6 boy-to-girl ratio. It is a surname meaning "little hollow" which relates to a place in Scotland. Similar to Logan, this name has a 93/7 boy-to-girl ratio. Dylan came in at #29 for boys in 2014 while it ranked #394 for girls. In the end, there were over 10 thousand male Dylans and just over 800 females. This Welsh name meaning "great tide" ranks at #10 on this list! What do you think of my top 10 list? Would you have crunched the numbers differently? If so, share your methods in the comments below! Welcome to our annual list of unisex names. This is where we analyze the gender ratios of each name. Some of these may not truly classify as a true "unisex name" because they will swing very heavily to one side or the other. I chose to include some names like that because it is worth mentioning, especially if it ranked at 3% last year and now ranks at 5%. That means the name is beginning to gain more popularity for the minority gender. Over time, it could continue to change and become more of a 20/80 thing and perhaps later a 40/60 thing. Wouldn't you like to be able to guess these things in advance if its a name you're pondering for a future child? There have been many cases where a name was traditionally male and it was then slowly taken over by the girls. Some of those formerly male names are now considered completely female. Names evolve. If we can catch them in the act, well, I think it would be exciting. I'm only mentioning all of this because last year I got comments regarding my monitoring of names like Ryan that were only given to 3% of girls. Yes, that does not mean that Ryan is a unisex name through and through. BUT it means that Ryan could potentially gain more usage for females over time and end up becoming a true unisex name. Take a look at the current trend in Hollywood. It seems like every other week we're hearing about a new celebrity baby girl being given a masculine name. While it may or may not catch on with mainstream parents right now, it could happen eventually. Things seem to be moving that way already and you never know what the future of naming might bring! There are likely many more examples of these. Now we are going to take a look at all of the potentially unisex names in the Top 1000. First, the following are the names that swing more toward the female side, meaning they have 60% or more usage for girls with 40% or less for boys. The most popular unisex name, meaning the name with the most usage across both genders, is Avery with over 9 thousand births for girls and 2 thousand for boys. This means they both rank well at #13 and #186 respectively. Both Skylar and Skyler are gaining for the girls whereas Tatum, Finley, Alexis Kendall, and Morgan have shifted toward the boys' side. If you would like to make more comparisons from 2013 to 2014, take a look at our previous article featuring the Boy-to-Girl Ratios of Unisex Names in 2013. The name that is officially most unisex for the year 2014 is Landry. There was only a difference of one birth between the genders which makes it a [rounded up] 50/50 split! It's the closest I've ever seen two names come to being equally used for both genders! The next closest name is Azariah with a 49/51 split which is very close! Justice gained 4 percentage points for the girls over 2013. One name was a big mover in particular this year: Skyler jumped 10 points in favor of the girls in 2014. The following names lean more toward the male side but are still used for females too. These have a range of 60% or more for boys with 40% or less for girls. 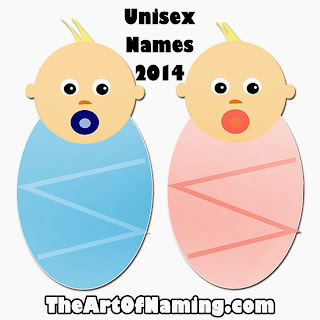 There are several names in the 90th percentile range that most people today would generally consider to just be boy names, but since they do get a handful of feminine usage, it's wise to keep an eye on the changes from year to year. For instance, a few of those names that ranked very-masculine (in the 90s) have had some changes from 2013 to 2014. Logan gained more female births and lost some male births. It was 95% boy in 2013 and is now 94%. Ryan had more female births in 2014 which made the males lose 2%. Similarly, Hunter also had more female usage resulting in a lost of 1% for the boys. Interestingly, spelling makes a difference. Out of all the Carters born in 2014, only 3% of them were female, however, 11% of all Karters were female. Ryan is mostly masculine since only 6% of them were girls, but add the ever-popular letter L to the mix and suddenly 16% of all Rylans are female. What do you think of these stats? Can you point out anything interesting that I missed? What are your favorite unisex names? While everyone will have differing opinions about which are The Very Best J Names for Boys and Girls, I'm sure many can agree that Juno is an interesting and unique choice! 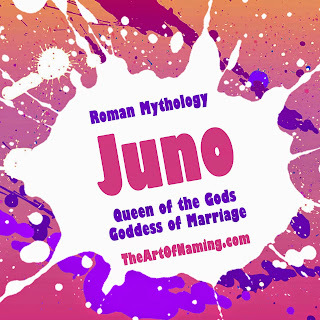 The feminine name Juno is very mythological. 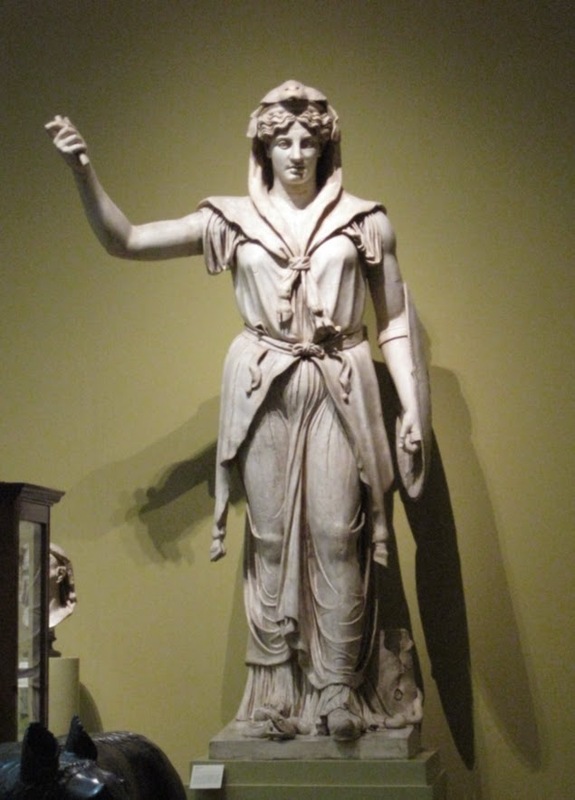 The ancient Roman goddess was a daughter of Saturn, the wife (and sister!) of the Jupiter and the mother of Mars and Vulcan. She was the goddess of marriage and childbirth and often looked after the women of Rome. Juno was also the Queen of the Gods, known as "Regina" which means Queen. 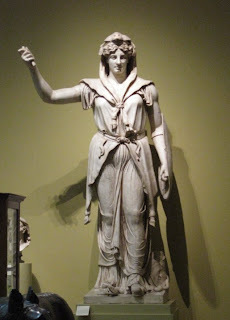 Her Greek equivalent is the goddess Hera. The meaning of the name Juno is generally thought to be unknown but some speculate that it is related to an Indo-European root word that means "youth". Juno is a variation of the Roman name Iuno. Other related names are Iunius, Junius, Iunia, and Junia. As a name, Juno isn't very used in the US. It randomly charted way back in 1919 with 6 births and it wasn't heard from again until 1996. This name really wasn't on anyone's radar until the popular Indie film Juno came out in 2007. There were only 7 girls with this name in 2006, but because of the film, 11 girls were given the name Juno in 2007 and 33 in 2008. It has continued to slowly inch up the charts after that with a peak of 61 births in 2011. As of 2014, though, the name Juno has declined a bit to only 49 births for the year. Interestingly, this name is also being used for boys despite the strong association with the goddess. It actually had more births in 2007 for a boy than for a girl but it didn't get a usage boost after that. It wasn't given to boys at all in 2010 but the year 2014 had 15 boys named Juno. While I've seen this name get thrown around the baby naming community quite a bit, it has yet to catch on with mainstream America. However, that's probably a good thing because Juno can continue to remain a rare gem for the time being. If you are interested in using this unranked and unusual name, your child will be one of a kind in their school. What do you think of Juno as a name? Would you use it for a boy? What middle name would you pair with it? Share your thoughts in the comments! There seems to be such a plethora of choices for the letter J that it was difficult to narrow them down. Do you agree? Perhaps this was just a tough letter for me. Throughout this alphabetical name series, have you come across a letter that gave you a hard time narrowing down the names to just 25 for girls and 25 for boys? The opposite can be true, too, if a letter doesn't have nearly enough lovely choices to fill up the list. What are your problem letters? 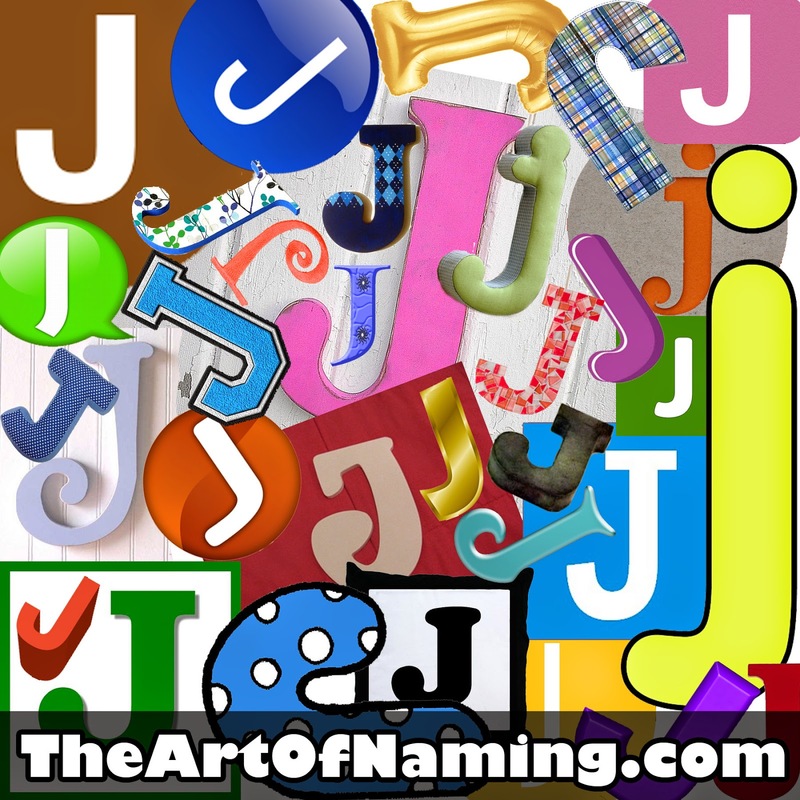 I hope you'll enjoy this compilation of the very best names that start with the letter J. Do you agree with the ones that I chose? If not, which would you remove and what would you replace them with? How do you like these J names? Share all of your thoughts in the comments below! And don't forget to click the links at the bottom for more alphabetical names!